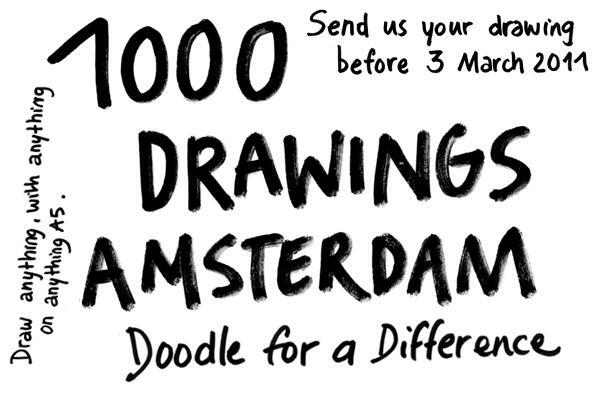 The people behind 1000 Drawings Amsterdam asked me to help promote their event, and if there was ever any event that matched with our goals and content it would be theirs. Next week on Thursday, make sure you are in club Trouw to support this great charity and enjoy a good evening. They have music, they have a fashion show and of course, a 1000 drawings. I can’t really explain their concept better than they do themselves, so I’ll let them do the talking. See you there! We collect thousands of drawings on A5, from renowned artists, local amateurs, children, all are welcome. We believe it doesn’t matter who you are, everybody can doodle for a difference, allowing many people to contribute to a charity by cultural and artistic means. The A5-drawings come in at an incredible speed, artists around the world are enthusiastic to make their contribution. So far we have collected more than 700 drawings from art academies, creative initiatives, local artists like Jan Rothuizen and Argibald, but also A5 sized art from New York, San Francisco, Berlin, Ireland, Cape Town and Bangkok (and more) has found its way to Amsterdam. An expected total of over 1000 drawings will be exposed and sold on Thursday 3 March for only €10 a piece. Something beautiful for everybody! Trouw Amsterdam opens for inspiration in the broadest sense. Join our unique creative experience and participate in our workshops, enjoy music and performances, and cheer for the artists at the Doodle Jam. And of course submerge yourself in viewing the 1000s of cool, unique, weird, sweet, amazing drawings we are selling! All creative talents are put into the mix to FUNdraise money for the Bonnytoun Prison in South-Africa. You don’t just ‘donate’ money, you donate drawings and if you’re fast enough you can get your ‘favourite pick’ out of all the 1000s of Drawings. First come, first served! You might take home the next Warhol 2.0! In 2011 you can doodle and donate (= purchase drawings) to help the children in the Bonnytoun Prison in South Africa, a project by Young in Prison, who offer education and creative workshops to help them return into society with prospects for a better future!